Celebrate Twin Cities Pride with Hennepin County Medical Center! Join us as we participate in Twin Cities Pride for our eighth consecutive year. We are committed to supporting our LGBTQ community. Diversity and inclusion are an important part of our values and drive our mission. We are honored to serve people of all different backgrounds with care and respect and are dedicated to providing our community with tools to live healthy and happy lives. Stop by the HCMC booth at the festival on Saturday, June 24 and Sunday, June 25. Connect with HCMC providers and staff, test your knowledge at health trivia, take a photo with Bernie the Rescue Dog and learn about our Pediatric and Adult Gender and Sexual Health programs, Positive Care Center and LGBT & Allies employee resource group. Watch for HCMC employees in the parade on Sunday, June 25. 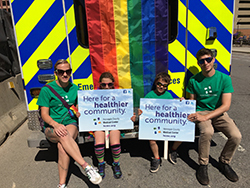 We’ve been recognized as a Leader in LGBT Healthcare Equality in the Healthcare Equality Index for the fifth consecutive year and proud to share our mission of ensuring equal access to healthcare for all. Preparing to move to the new Clinic and Specialty Center next April is much more than packing boxes and moving the equipment to a new location. In reality, it represents a tremendous opportunity to rethink clinic flow, standardize the process and determine what it will take to deliver the best experience for our patients and the most efficient model for providers. It’s tick season! Prevent contact, know the signs and symptoms. Take preventive measures against ticks year-round, especially in the warmer months from April to September, when ticks are most active. How can I avoid contact with ticks? Walk in the center of trails. Avoid walking off the trail. On a perfect Saturday evening, 2,500 people gathered under the façade of the legendary First Avenue music venue for a concert to honor and memorialize Prince. Midway through a classic Prince tune, a Hennepin EMS ambulance drove past on 7th Street with its siren perfectly in tune with the band. This was just chance, of course. But it also made me think about what healthcare can learn from a rock club.